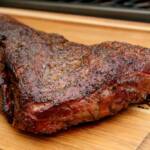 Smoked tri-tip is one of my favorite cuts of beef that I cook on the smoker. 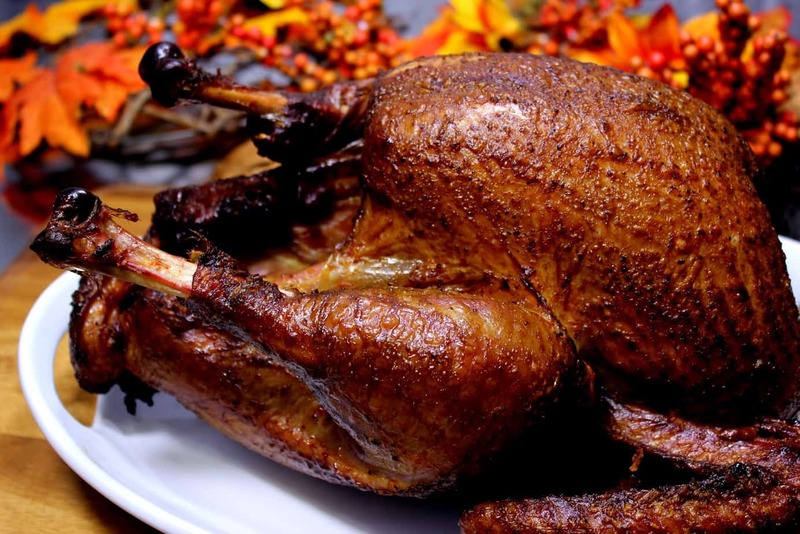 It is tender, delicious and doesn’t take a long time to prepare. 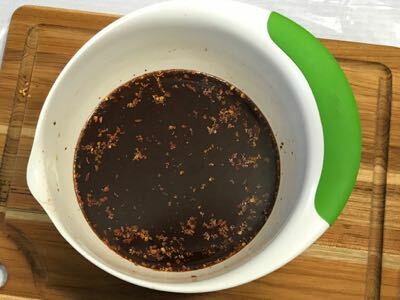 In this version, I used an espresso brine that incorporates coffee as well as a touch of cocoa to really make that delicious beef flavor pop. The salt in the brine, as with all brines, helps to bring out the natural flavors of the meat. 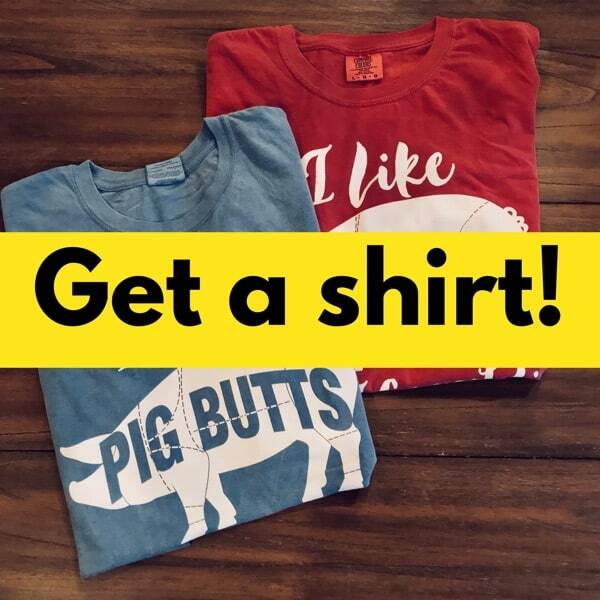 I think you’re going to like this one a lot! 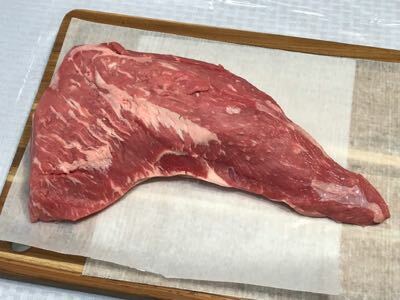 A tri-tip will usually have a fat cap on one side. If the butcher has not already trimmed this down or removed it, you can do this yourself using a very sharp knife. Sometimes I remove it and other times I leave it along. Either way, it's not a problem. As you can see there's plenty of fat marbling so that's what will keep the meat moist during the cooking process. Add the kosher salt and stir until it is dissolved. Add the cocoa and red pepper flakes and stir well again to make sure the cocoa is dissolved into the liquid. 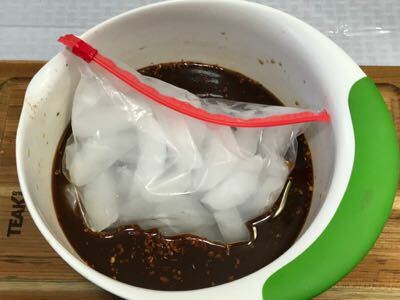 If the coffee is still warm, add some ice to cool it down. I recommend placing the ice in a bag first so it doesn’t dilute the brine. 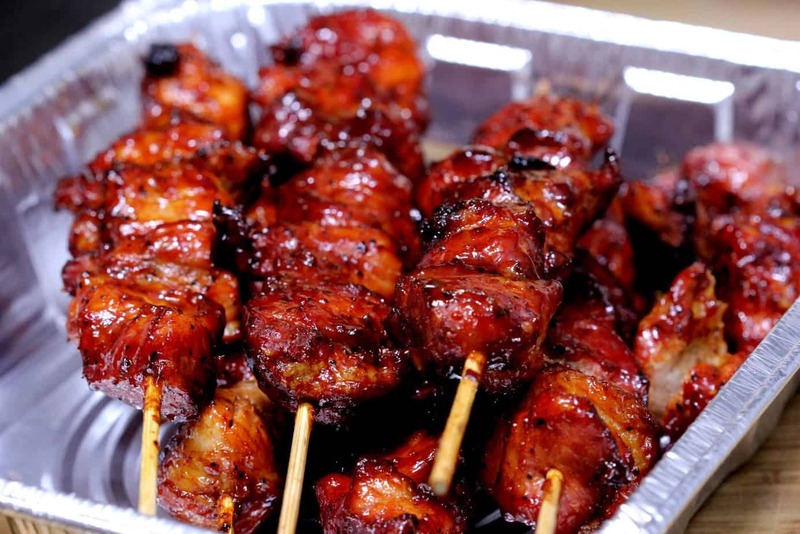 Place the meat into a shallow container or even a 1- gallon sized ziptop bag. Pour the brine over the meat to cover. Put the container with the meat and the brine into the fridge during the brining process. About 3 hours should be sufficient time. Remove the meat from the fridge after brining. Set the meat aside and discard the brining liquid. There is no need to rinse the meat. 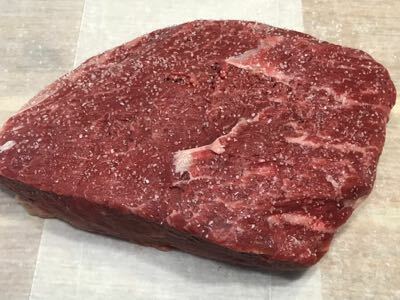 The brine helps to bring out the natural beef flavor but it’s also really good to add some seasoning to the outside, what will become the crust. For this, I highly recommend my Texas style rub* recipe. 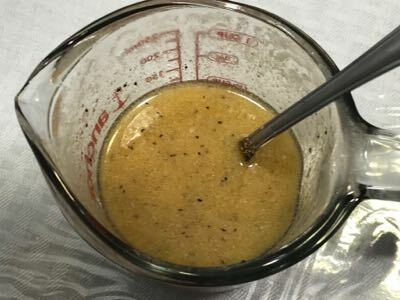 Usually when we add seasoning, I recommend brushing on some vegetable or olive oil or even some yellow mustard to help the rub to stick however, if you add the seasoning just as soon as you remove it from the brine, the meat will be somewhat wet and the rub will stick to the meat really well. After you season the top side of the meat and the edges, flip it over and season the bottom side as well. 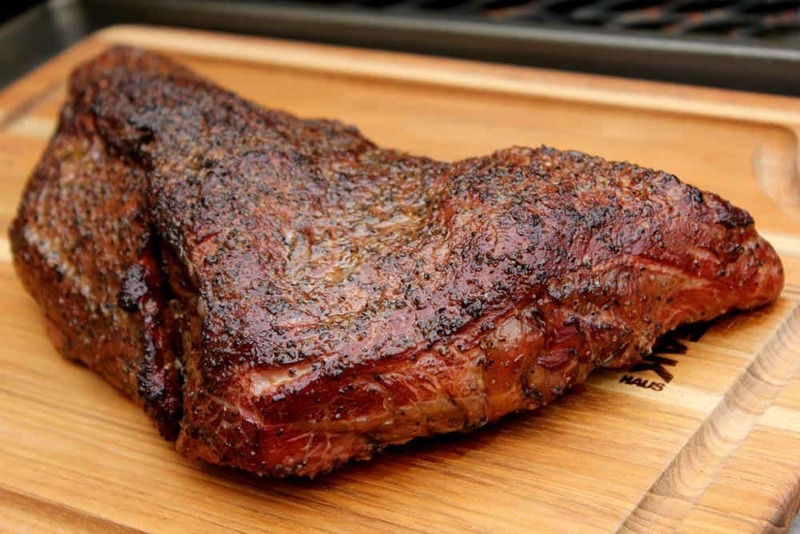 Once seasoned, place the tri-tip on a Bradley rack or a Weber grill pan for easy transport to and from the smoker. The meat can be left on the pan during the cooking process if you so desire or you can remove the meat from the pan and set it directly on the grate. You'll notice another piece of meat on the pan below.. that's a tri-tip that was not cut properly.. as you can see, it's more square than triangle shaped as it should be. I got a good price on it and it was prime grade so I just dry brined that one to compare flavors. 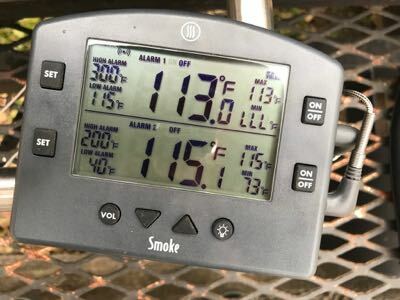 Set up your smoker for cooking at about 225°F using indirect heat. If your smoker uses a water pan, fill it up. 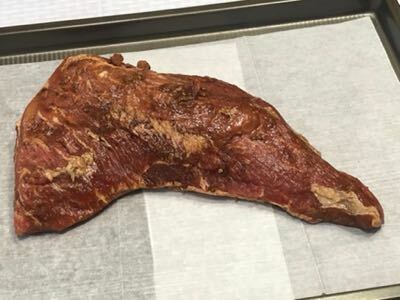 Traditionally, tri-tip is smoked with red oak but I have used pecan, post oak, cherry, apple and even a mixture of some of these and it always turns out great. This can be in the form of chips, chunks, pellets or large splits just depending on what type of smoker you are using. 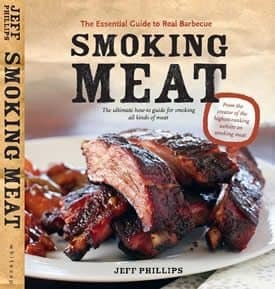 I don’t say this often but maybe I should: there is no need to soak the smoking wood. 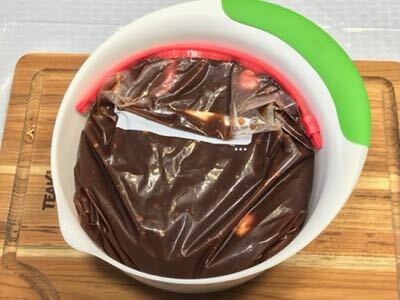 This is something that is still touted in some smoker manuals, recipe books, and even on cooking blogs but there is absolutely no reason to do this. Wet wood steams until it dries and then it produces smoke. Dry wood begins producing smoke a lot faster. 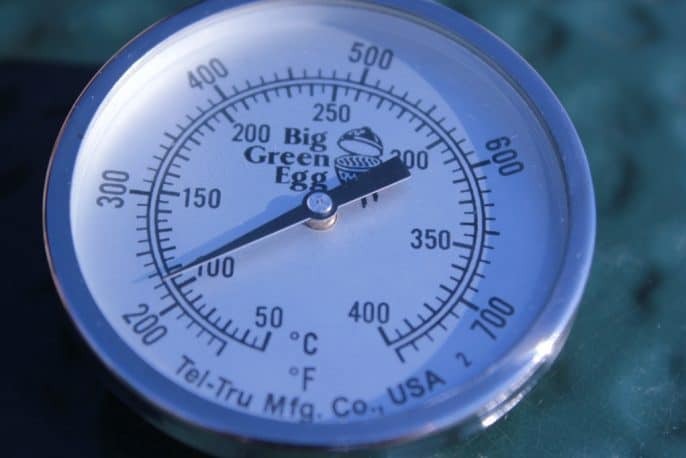 Once your smoker is heated to 225-240°F and holding steady, it’s time to place the meat in the smoker. Place the meat or the pan of meat onto the smoker grate and close the door/lid. 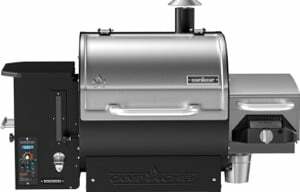 If you are using a charcoal, electric or gas smoker, I recommend allowing the smoke action to continue for at least 1 hour and then it can be finished with just heat. 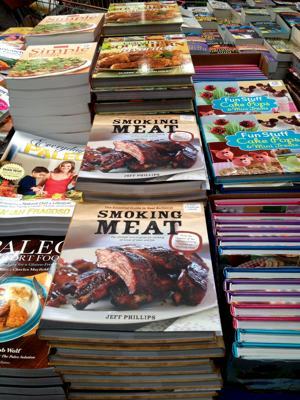 It is also ok to apply smoke the entire time to simulate the flavor of a wood or pellet smoker. 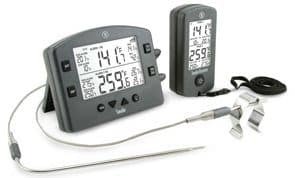 Monitor the temperature of the tri-tip very carefully. 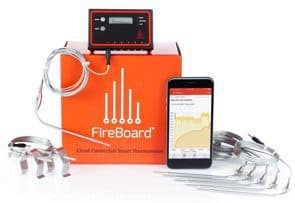 I used the dual-probe “Smoke” by Thermoworks to monitor both pieces of meat at the same time. At about the 110°F mark, melt a stick of butter (¼ lb) and stir in 1 heaping TBS of the Texas style rub*. When it reaches 130-135°F or a perfect medium rare, remove it from the smoker. Tip: If you remove it at 130°F, the carryover temperature will usually bring it on up to a perfect 135°F during the resting period. If you like your beef more done, be my guest but it will never be as good as it is at medium rare. The flavor, texture and juiciness degrades quickly beyond medium rare so tread carefully. Let it rest with foil tented over the top on the cabinet for about 10-15 minutes before slicing or cutting into it. This allows the juices to redistribute throughout the meat and dissipates some of the pressure that has built up inside the meat during the heating process. Slice the meat pencil thick across the grain and serve immediately with plenty of vegetables and sides. I mentioned earlier that I cooked (2) tri-tips.. one was a “square tip”. The square one was dry brined with only salt for 3 hours in the fridge.. Here's an idea of the salt distribution that I used. Note: If you want to measure, about ½ teaspoon of kosher salt per pound of meat is the correct amount for dry brining almost any cut of beef, pork, chicken, etc.. It was very good and had a slight advantage since it was prime grade whereas the other tri-tip was choice grade. The tri-tip brined in the coffee had a more robust flavor but wasn't more salty than the dry brined one. Both of them were very similar in saltiness. I must stress that it wasn't overly salty at all. It had just enough to really bring out the natural flavors of the meat. 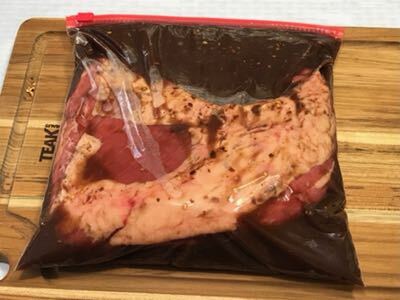 If you prefer, you can definitely use the dry brine technique and 2 hours is sufficient time but I recommend you try using espresso or coffee brine for your lean beef cuts. It doesn't taste like coffee when it's all said and done but it does add a little something to the meat. Trim the fat from the tri-tip using a sharp knife. To make the brine, pour 4-5 cups of coffee into a ½ gallon pitcher or large bowl. If the coffee is still warm, it will need to be cooled before use. Place the meat into a shallow container or even a 1- gallon sized ziptop bag and pour the brine over the meat to cover. Place in the fridge for about 3 hours. Season the top side of the meat and the edges with Jeff's Texas style rub, flip it over and season the bottom side as well. 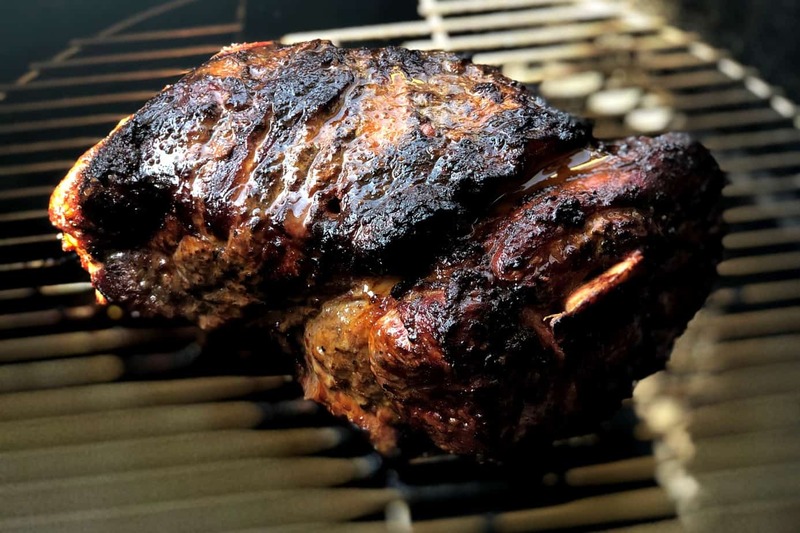 Once your smoker is heated to 225-240°F and holding steady, Place the meat in the smoker and let it cook for approximately 2 hours with at least 1 hour of smoke action. 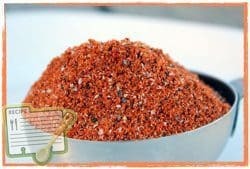 At about the 110-115 degree mark, melt a stick of butter (¼ lb) and stir in 1 heaping TBS of the Texas style rub. Baste the meat liberally with this mixture. 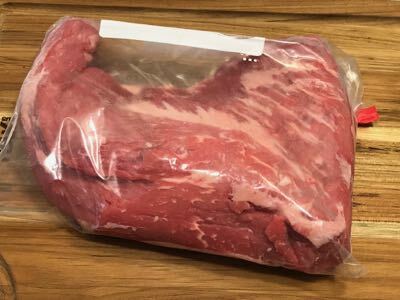 When the meat reaches 137°F or a perfect medium rare, remove it from the smoker and let it rest with foil tented over the top on the cabinet for about 10-15 minutes before slicing or cutting into it. Used this espresso brine on my Christmas Prime Rib. Outstanding! Double the recipe and brine overnight in a large stockpot. You won’t be sorry. Would this work on a whole beef brisket? I’m still new to the smoking world and not that familiar with my cuts of meat. 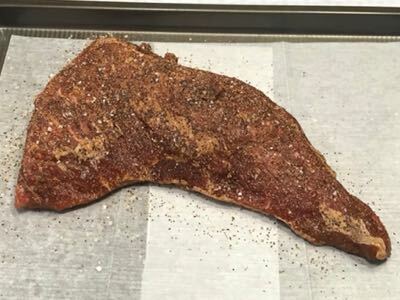 Brisket probably is not considered “lean” as you mentioned in a previous comment but thought I would ask. Kevin, I have not tried this particular brine on a brisket but it should work great. 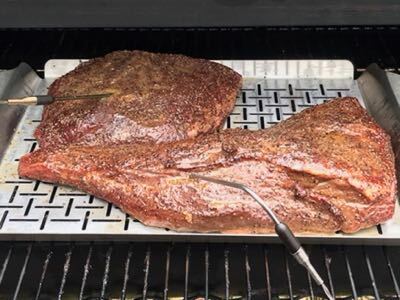 The brisket is fattier and has more connective tissues and for this reason, must be cooked much longer and to a higher internal temperature before it is tender and ready to eat. ‘Espresso-brine’ sounded intriguing when I first read the title, but saw the ingredients listed 4 cups of coffee (not espresso). Big difference in strength and boldness of flavor. I suppose “Coffee-Brine” isn’t as exotic sounding but it is what it is. Being both a coffee and espresso lover, I still look forward to giving this recipe a go! Thanks! I’m with you on the difference between espresso and coffee.. I love my espresso shots in the morning to get my day started with a bang. Thing is, in cooking, the words “espresso” and “coffee” are often used interchangeably as if they are one and the same. You can definitely use the stronger strength espresso if you are feeling crazy and bump up that coffee vibe a few notches. My advice, use whatever you are used to drinking and can make in a large enough quantity to use it for brining. Hey Jeff. 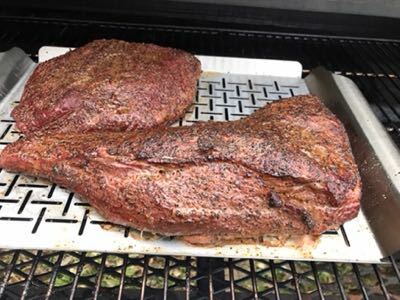 Love me some Tri-Tip and this recipe looks tasty. I’ll have to give it a try. One thing I have found that people do wrong with this cut of meat is the slicing. 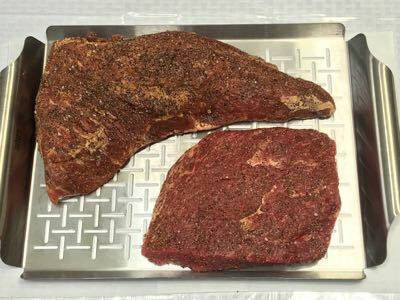 The grain in a properly cut Tri-Tip actually runs in three different directions (see the image linked below). What I might suggest is that you add an image similar to that one, and tell them to cut across the white lines in the image. 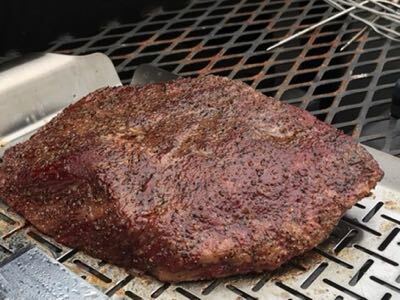 Yes, I have used the original rub on tri-tip many times and it’s very good. 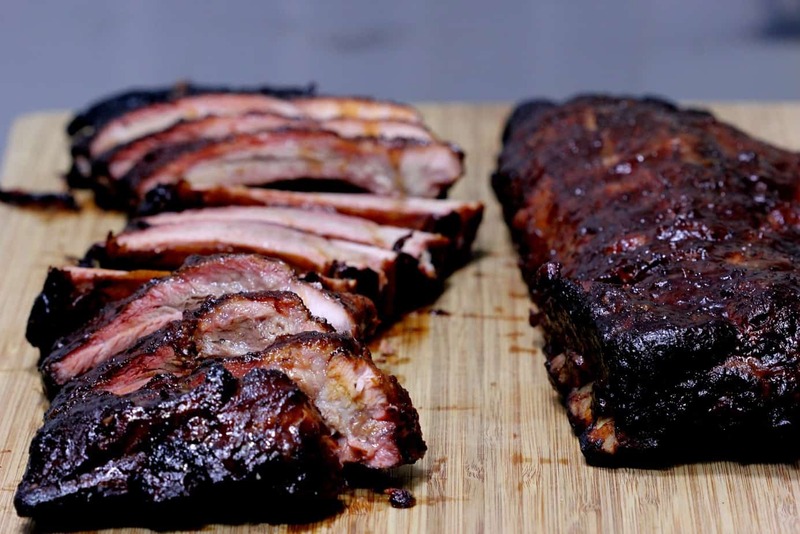 You could also use my original rub with some coffee in it as recommended at https://www.smoking-meat.com/october-10-2013-coffee-brined-smoked-baby-back-ribs. It’s basically ¾ cup of my original rub with ¼ cup of finely ground coffee mixed in. I cannot find tri-tip in my area. I saw that you recommend any lean, tender cut. I don’t know my cuts good enough… could you please suggest your top 2 or 3 alternative cuts? I owned a business for 28 years and amoung many other products, we sold many brands of grills and smokers, including many trailer smokers. We also competed in many bar-b-q competitions in Kansas City and other sanctioned events in Oklahoma and Kansas. I am friends with many national and even world champions. I say all of that to let you know that I really value your emails. You do a great job all around. Your information and techniques are valuable to folks at all levels of expertise. 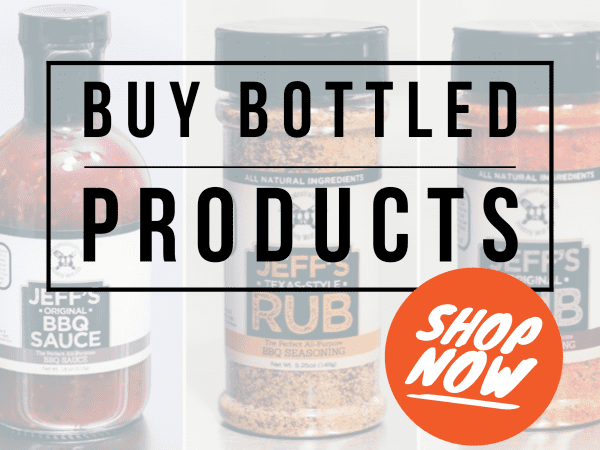 I have purchased your sauce and spice recipes and use them all of the time. But, I have either lost your Texas style recipe, or perhaps I have never had it? Is it purchased seperately? I have never used it and would like to try it. Please let me know if I need to purchase it. I missed this before the holidays.. for that I apologize. 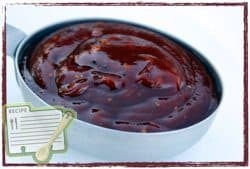 I just re-sent the download email, which contains the original and Texas rub recipe as well as the sauce recipe, so you’ll have it from now on. Let me know if you need further help with this. OMG this is good! Never had tri tip before but this recipe sounded so good I had to try it! Boy am I glad I did! Thank you! I tried the Tri Tip Coffee Brine and used the Texas Rub. Holy “smokes”!!! It was excellent. However…I did have leftovers. So I decided to slice them up into bit size pieces and pan fry in a cast iron skillet to reheat, fried up some corn tortillas to make homemade taco shells and ate some of the best tacos I ever put in my mouth. 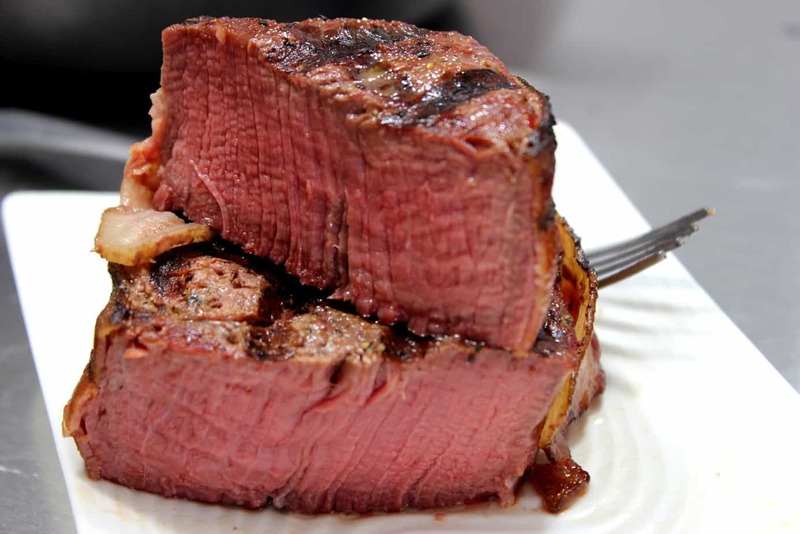 Have you tried this method with a beef tenderloin? I have not tried this with a beef tenderloin but I think it would be excellent. Any lean, tender steak would work great with this brine and this method. What type of coffee did you use? was it an instant espresso or ground beans and then dripped coffee? I used a dark roast semi-fine grind.. not quite espresso. Any coffee will work.. I prefer the dark roast for sure.